Great news….we found another Victress employee – and a very special one at that. Barry Tousley joined Victress in late 1953 – the same time as Merrill Powell – at the ripe ole’ age of 9 (Merrill was older than Barry). That’s right….9 years old. He had to get permission from his mother first, but we’ll get to that part in a minute. Born July 5, 1944, Barry, his sister Mary Ellen, and his mother lived in the North Hollywood, California area – directly across from Victress Manufacturing. His Mom worked “The Ivy House” which was close to their home. The kids in Barry’s neighborhood used to canvas their area and collect pop/soda bottles to turn in for the 2 cent deposit. Barry, ever the enterprising young man, decided to do what any good young “master” businessman would do – he expanded his territory to across the street at the industrial park. Victress was one of the many businesses across the street, and it looked like a promising move. And as you’ll find out…it certainly was for both Barry and the gang at Victress. Barry started to go over to the industrial park about once a week, and the guys in there – mostly the folks at Victress – started to save the bottles and waited for Barry to come and collect them. 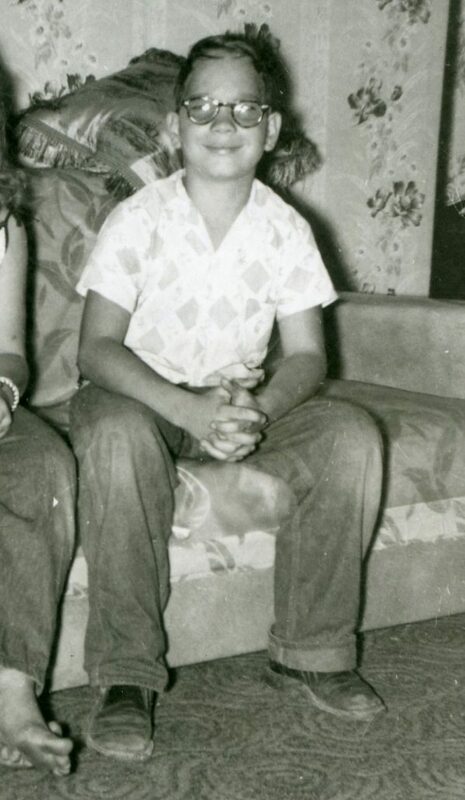 This was late in 1953 and Barry was just nine years old. And Barry was serious about his task – and for good reason. His family was like many families across America and was trying their best to make ends meet. 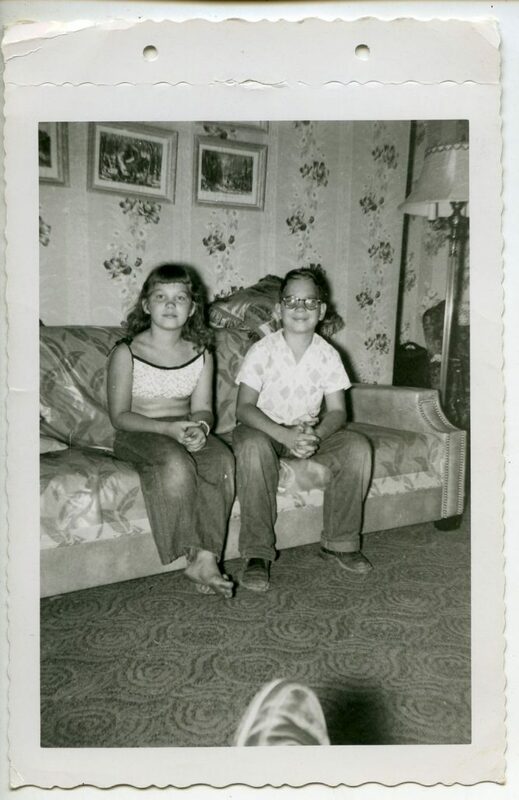 Barry and his sister Mary Ellen in 1954 – when Barry was 9 years old. His sister is about a year younger than Barry. He continued collecting bottles for a few weeks in the fall of ’53, and then the guys at Victress surprised Barry. Doc Boyce-Smith, Merrill Powell, Bill Quirk, and others decided they would offer Barry a job – the first and only young Victress apprentice they would hire. First, though, they contacted Barry’s mom to get her permission, and the next time Barry came over to collect bottles they sprung a question on him. “Would I ever!! !” Barry remembered saying. 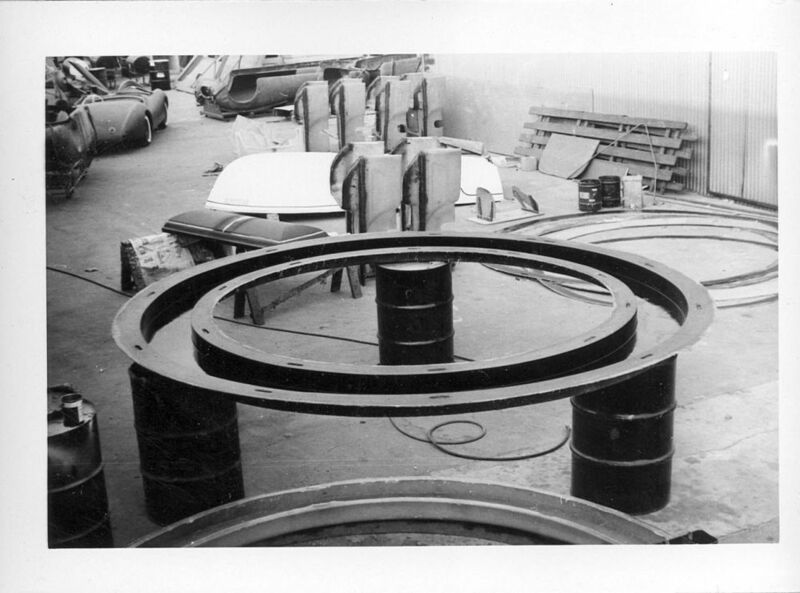 A typical day at Victress Manufacturing. Was Barry hiding just outside the camera angle this day??? Barry remembers working at Victress for about 6 months and stopping in the summer of 1954. He earned more than a $1 a week and less than $3 – from what Barry and one of his bosses – Merrill Powell – remembers as of today. 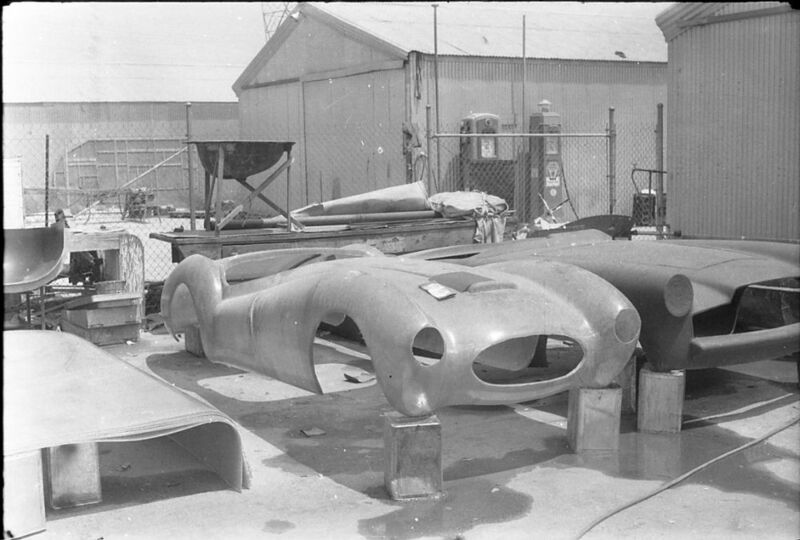 Check out the Victress S1A Mold and Car at the rear of this photo. 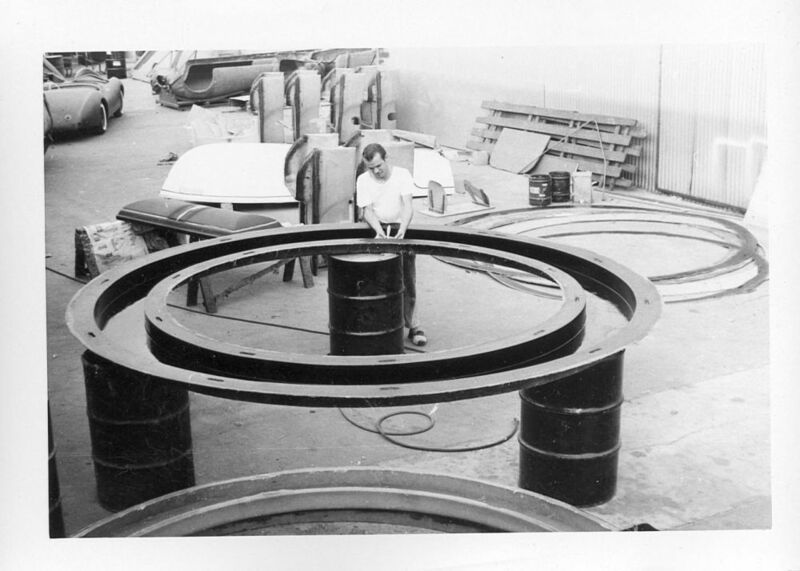 Here is Tom Sane working on the Olympic Rings for Squaw Valley – more about this in a future story here at Forgotten Fiberglass. Although Barry left Victress in 1954, he caught the “car bug” from his days there. Barry told me that working at Victress at such a young age imparted a love for cars on him – something he started working on when he was 15 years old and got his first car – a 1951 Mercury. But his memories of Victress held strong with him for over 50 years, and it was last year that he first found an article showing the name of the car and the place where he worked – Victress Manufacturing. 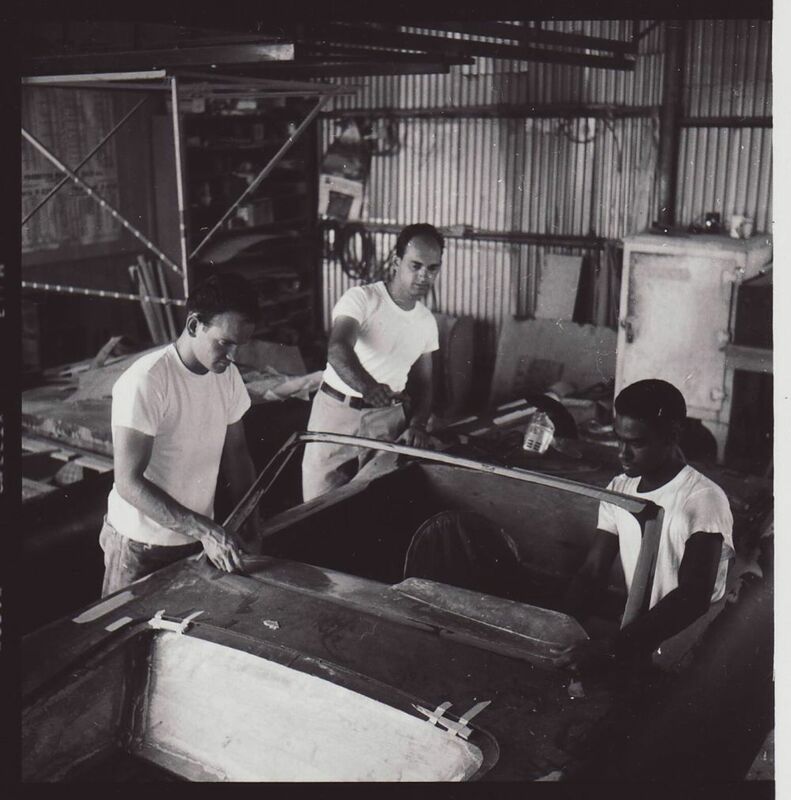 It wasn’t long until he found us at Forgotten Fiberglass, and we put him back in touch with the folks he worked with – Merrill Powell and Bill Quirk. A fun reunion was had by all. 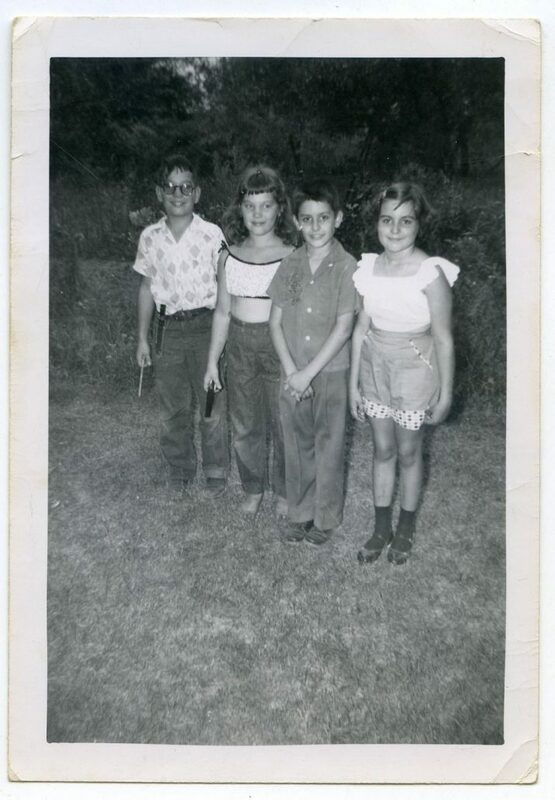 Let’s have a look at more photos from Victress from back in the 50s. This is what it was like when Barry worked there, and perhaps Barry himself will chime in with some comments at the end of our story below. But the story doesn’t end there. And in fact….you can help too. We’re now on another quest for Barry. He would like to find, build, and/or restore a Victress S1A roadster. Something he can cherish as part of his legacy for himself and his family. Barry and his family live in Marysville, Washington and now we have our new task. To find a Victress that he can see with his own eyes – for the first time in over 50 years. And…perhaps find a special car for Barry and his family to begin to build and/or restore. Who wants to join in the fun and find an S1A for Barry? Add my name to the list here gang and let’s see what we can do for Barry! Is that the back of a LeMans coupe in the next to last photo? Great story, Geoff. As to the car itself, the one I owned (an S1, not S1A) is one of the most memorable cars I’ve ever owned or driven. First, no one, including me, knew what it was at the time (this is 1970), it was admired abundantly, it was comfortable and could be driven daily….in the rain…….IF you didn’t care about getting a tad wet due to no side curtains. No, it was not the best handling of the pile, but it was reasonably powerful and comfortable. I wish I still owned it. Barry, keep those memories alive and I hope you can find one! 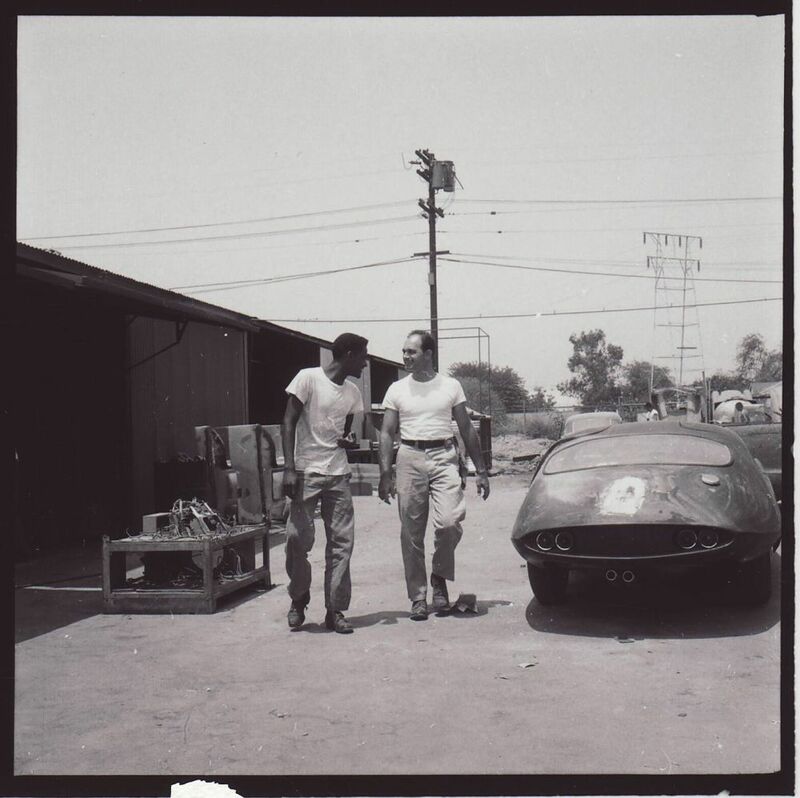 In the picture of the LeMans Coupe, That is Merril , walking with my friend Alton Johnson, the builder of the coupe. The shop that Alton used to build the coupe was the next to last one on the left building. 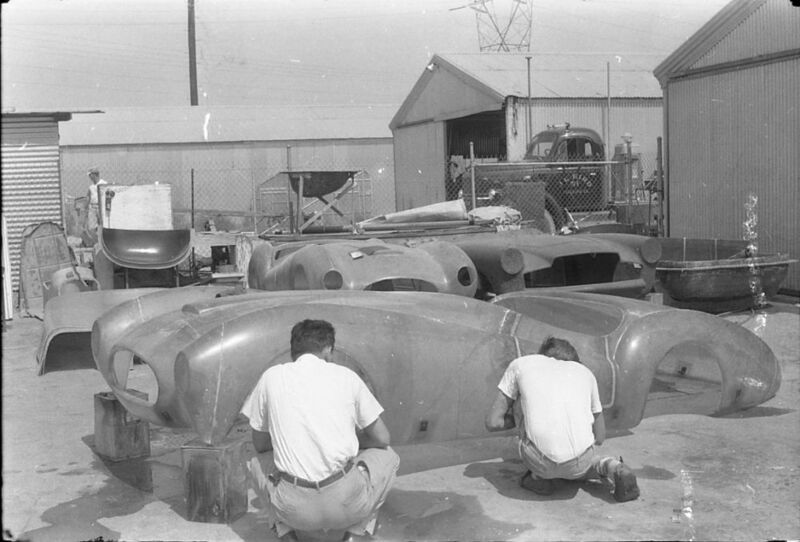 In the previous picture of the 3 guys in the roadster picture, I believe it is (L to R) Bill Quirk, Merril Powell, and Alton Johnson. I remember these fellows well from the times I visited the Victress shops and helped Alton work on his car. Good memories. Great to read the article about Barry. He was the neatest little kid, and we all took to him immediately. He was very earnest and enterprising, and was a good worker. It was a pleasure to have him around the shop. It was unfortunate that his family moved away, or he might have worked long enough to become company president! 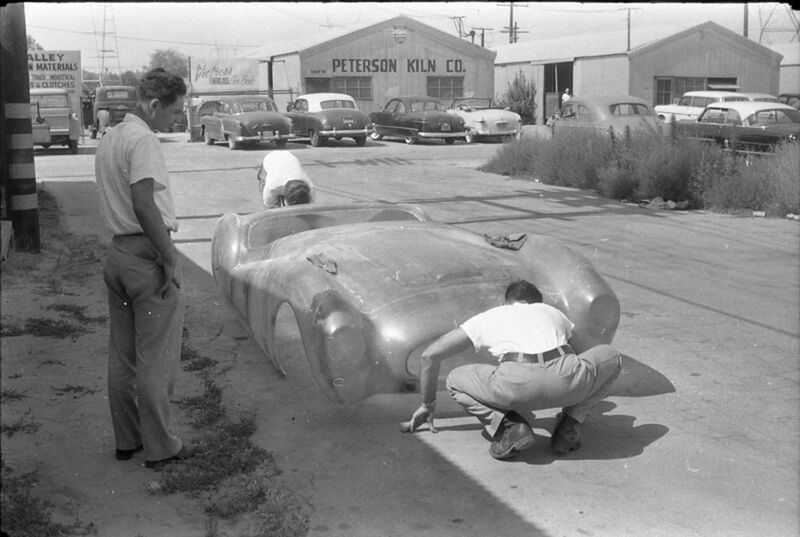 The picture with Quirk, Alton Johnson, and myself appears to be with the Nickel-Silver Pioneer prototype in development. We seem to have resurrected the overhead contour transfer rack from S-4 development several years earlier, in spite of the fact that it was susceptible to errors induced by sun-related building movement. I’ve known Barry since he had his first car, the 1951 Merc, and I was never aware he had wored for Victress. Good luck on finding your S1A roadster.